Perhaps this would be just the ticket for me these days – I'm feeilng a little bleak myself, having just been diagnosed on Thursday with a form of glaucoma which moves along rather quickly. Tuesday there will be more tests, and then the devising of a treatment plan.I hope their technology's really good, as my left eye isn't much good at all for reading at this point. It seems Lady Dedlock's got it right. Just "flying away" is an imperfect solution – some things can't be flown from! Thanks for the reminder about Carl's challenge, too. I can hardly believe the year's moving so quickly! ds, the classics are unbeatable aren't they?Linda! I'm so sorry to hear of your eye trouble!!! I will be praying for your sight, your peace, your healing. Seriously. Oh now you remind that I still haven't read Dickens again. The only time I've read him was when I was in high school and my copy of Great Expectations was even an abridged one. Shame on me. I must put him on my list this year. 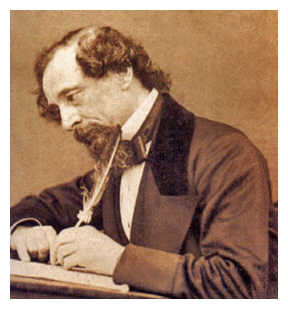 I really want to love Dickens, but all I have read of his is A Tale of Two Cities, which was not my cup of tea. I hope to join this read a long once I am done with The Brothers K, if that ever happens! I haven't got as far as Dickens yet, though I've been reading the posts on Bleak House. Like the quotation, I wasn't sure what his writing style was like! I love me some Dickens! He's fabulous, isn't he? I think the only one of his books I haven't liked so far was Hard Times. Just a little too bleak for my taste. A Tale of Two Cities is high on my re-read list. I've had to go way past Amanda's scheduled readings; I'm more than halfway through the novel now, and unwilling to put it down not only because I don't want to forget all the characters and nuances, but I must find out what happens to Lady Dedlock, Esther Summerson and the never-ending case of Jarndyce and Jarndyce. Every time I read one of the classics I'm reminded why they became so famous. It's almost impossible to touch the quality of their writing today. I'm so glad you're enjoying Bleak House. I'm…liking it a little better with each week. Dicken's writing isn't my favorite, but I'm glad I have the readalong to push me through! Amanda, it's great to have the read-along! It helps so much to have the input of others especially with a classic. I saw the PBS version of this a few winters ago, and that might partly be why it's not so difficult for me to read. Still, I can't remember enough to know everything that happnes, and there are enough nuances and dialogues to thrill me! Thanks for being our hostess. Oh.. I wish I had known earlier! I didn't realize we share a love for Dickens. Really want to read Bleak House but I haven't a copy yet. My Dickens to read next on the TBR is The Old Curiosity Shop..
Claire, I'm glad you're back! I missed you when your blog was marked 'private'. It may not be too late for you to join in Bleak House…but if it is, and if you want to read more Dickens as I do, would you like to host a read along with me? Of The Old Curiosity Shop perhaps? In the Spring?